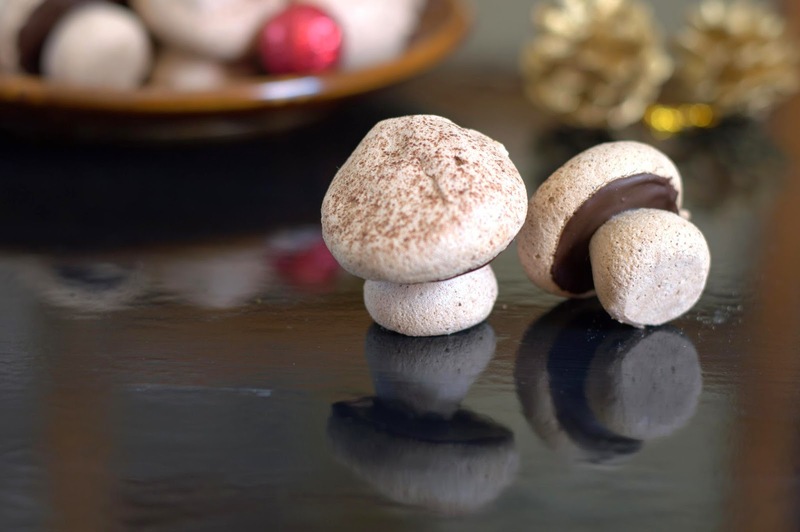 Cakes & More: Cocoa Meringue Mushrooms - Welcome December! 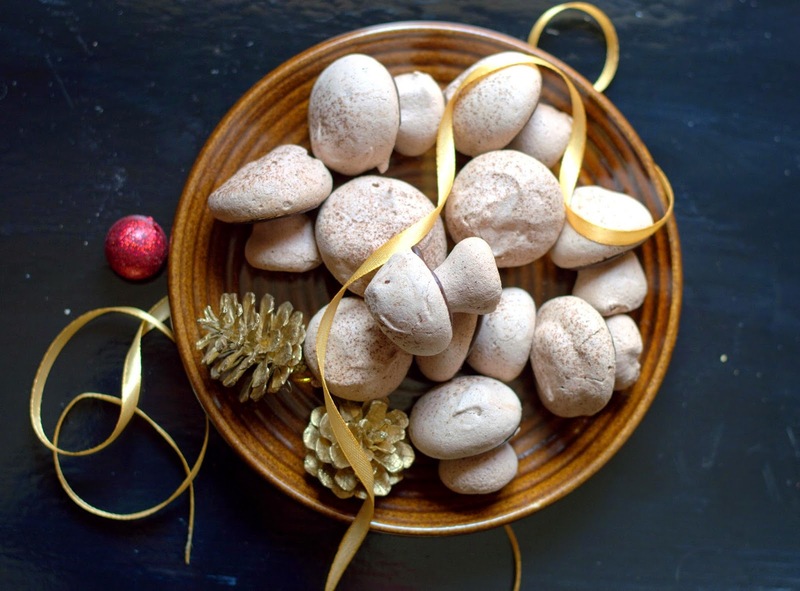 Cocoa Meringue Mushrooms - Welcome December! December is the baker's favorite month of the year for very obvious reasons! Fruit mixing, fruit soaking and Christmas cake-bake-talk is terribly infectious, making me look forward to the season even more. I normally tend to procrastinate forever about my Christmas baking, end up huffing and puffing to put up a post here before the season is finally over. This year however, I seem to be a tiny bit more organized as I find myself having more than one Christmas bake to post! Here come some Cocoa Meringue Mushrooms I baked a few days ago. I will have to confess I made these more for the festive feel, as otherwise I find meringue too sweet, but fun nevertheless ! Crisp and sweet, these cookies make a charming addition to your Christmas cookie platter or to decorate your Yule Log. The bonus, these can be made way ahead and stored airtight for a few weeks. This recipe for Crisp French Meringue comes from Rose Levy Beranbaum's Cake Bible. She had baked a batch of meringue shells when a French pastry chef visiting her remarks that they are heavy. Torn between insult and curiosity, she learns from him that using superfine sugar and some powdered sugar makes for lighter meringue. She experiments to bake the lightest meringues! Ingredients: Halve the recipe unless you have an oven large enough. Remember to halve the ingredients as you follow the procedure. Extra cocoa for dusting on top. Pre-heat oven to 100 C / 200 F.
Line a heavy baking sheet with parchment. Sift the powdered sugar with the 2 tablespoons cocoa until uniformly blended, keep aside. Keep a teaspoon of cocoa in a small strainer ready for sifting over the piped meringue. Fit a pastry bag with number 3 round decorating tube. ( I have used my 1.5 cm plain nozzle) Poise it over a tall glass so it is easier to fill in the meringue. Make sure the bowl, the mixer blades, the cups, spatula, the weighing bowl and just about anything you use here is really clean, free of grease and dry. On low speed, beat the whites till frothy, then add the cream of tartar. Beat on medium speed while gradually adding 2 tablespoons superfine sugar. Do not rush adding the sugar. When soft peaks form when the beater is raised, add 1 tablespoon superfine sugar and increase speed to high. When stiff peaks are formed when the beater is raised slowly, gradually beat in remaining superfine sugar, beat until stiff and glossy. This reads like it will take a lot of but happens fast. So please do watch carefully as you beat. Sift powdered sugar over the meringue, fold in using a slotted skimmer or a rubber large spatula. Fill the meringue into the bag. Pipe domes in one tray and 'stems' in another. They don't need to look uniform or perfect (yay!). Smoothen any pointy tips with a wet finger or these may burn. Sift the cocoa lightly over the caps. Bake about an hour till dry and crisp rotating the pans halfway. I baked about 15 minutes more. Do not open the oven door the first 3 quarters of the baking time to prevent cracking. The most reliable way to test doneness says Rose, is to dig out a small amount of meringue from the center with a sharp knife. If only slightly sticky, it will continue to dry at room temperature. If not assembling the mushrooms right away, store them airtight. Can be stored 3 weeks at least. To assemble : Alice Medrich's way. Melt some dark chocolate (about 100 grams). Use a sharp knife to cut the tip of each 'stem' to create a flat surface. Place the caps flat side up on a baking tray. Spread some melted chocolate, attach the stems. Allow the chocolate to harden and then store the meringue mushrooms airtight immediately. Please note : To make superfine sugar I have just processed granulated sugar till very slightly coarse. 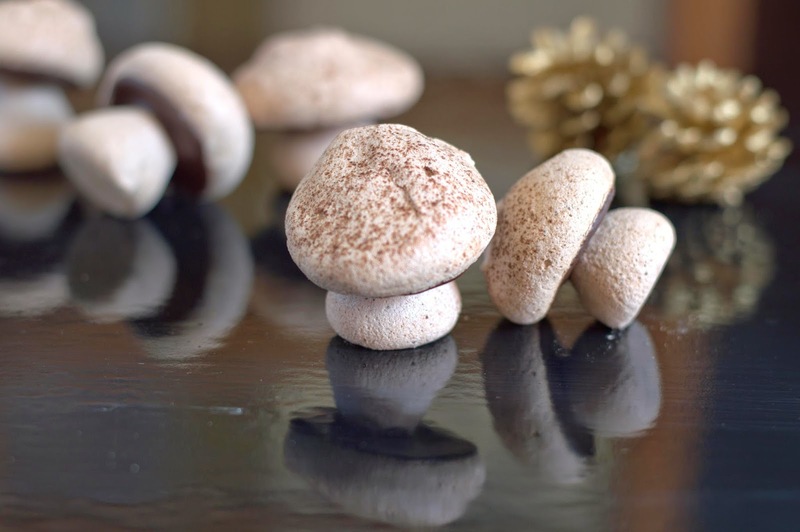 For making mushrooms and other figurines, Rose recommends using all superfine sugar ( 226 grams for the entire recipe) as it makes less fragile ones. I have used powdered sugar as mentioned above. Do bake these if you love meringue or just for the fun of it!These indeed were light, but the meringue amateur that I am, can't say if they were light enough. White meringue mushrooms look quite real in their imperfection. I took way more liberty and baked some really imperfect, rather unreal looking ones with cocoa! Just as I was about to begin, I realized the regular plug point I use wasn't working . With the bowl and my mixer finding just enough space between my wet grinder and the water filter, I was walking on egg shells as I went! Forgive me for not jotting down more details, but these should work fine even if they are not absolutely perfect. They will still be fairly light and festive of course. So what are you planning to bake this season? Please do share your favorite Christmas recipes with me! Bûche de Noël - Merry Christmas! Cakes and More by Suma Rowjee is licensed under a Creative Commons Attribution-NonCommercial-NoDerivs 2.5 India License. Video Series - Baking For Beginners! My Readers And Me, My Medals Of Honor!